Celebrating the first week with a freebie! Wow! It sure has been a busy week! I feel like I have run five miles every day, and that doesn't include my morning walk on the treadmill! I have helped out in so many rooms and am ready to begin my routine. I really enjoy working with all of the students in the lower grades. Kindergarten has been enlightening, to say the least. Nothing like doing the "Toody Ta" every day!! I have really enjoyed being back in my element in third grade. I worked on reviewing Thinking Maps this week with them. We worked through four of them throughout the week, and today we made a Circle Map of each type and presented them to the class. Here are some examples. Working on the "tree map"
For our Tree Map, we used Skippyjon Jones Class Action to show the story elements. This was perfect to help them understand the parts of a story. 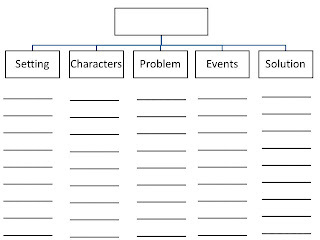 I made this one with Power Point to work with the students. I projected it up on the Smart Board and wrote on it with the students' ideas. I love this because it can be used with any book! It is in Power Point and is fully customizable. Nothing special, but it will save you time in making one! I am ready for a fun-filled weekend! Zack has his first soccer game tomorrow, which should be lots of fun! 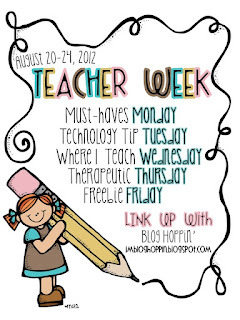 I am linking up with Blog Hoppin' for Teacher Week and Teaching Blog Addict's Last Freebie Friday of August! I love to use thinking maps! Thanks for showing these!